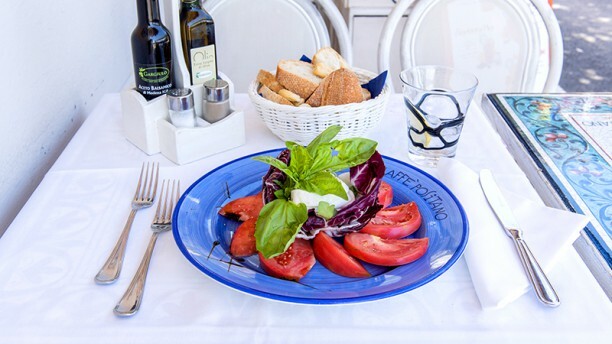 Il rinomato “Caffè Positano” sito nel cuore del paese, a picco sul mare, con incantevole vista sulla famosissima Spiaggia Grande e la Costiera Amalfitana, propone una cucina tipica della tradizione positanese in modo raffinato e leggero. I prodotti tipici della costiera sono sempre freschi e genuini, ed i piatti sono preparati con molta cura per esaltarne i profumi e i sapori, soprattutto nelle specialità di pesce fresco. CP has been wonderful for breakfast but dinner was a let down. Food was good but service was not. We'd made a reservation and when we arrived and communicated that we were asked what hotel we were staying at. We're not staying at a hotel, I replied. Then they again asked if we had a reservation. Yes, still do. But we were shuttled to a back room and largely ignored for the night. At first the server seemed in a rush to take our order -- came back 3 times within a couple of minutes. Then after we placed our order we never saw him again until it was time to pay the bill -- no water refills, no check in to make sure everything was OK. Maybe it was just a busy night (though it didn't seem so). Maybe something was lost in translation. Again, the food was good -- shrimp risotto, seafood fried to perfection, etc. Views were beautiful but the food was mediocre. Fantastic evening, attentive service, gorgeous views, and delicious food! Fantastico! We chose this restaurant on our first night in Positano. The view. from the restaurant was beautiful. Unfortunately the food was very disappointing. And the service was not very good. Food was great! We sat across the street at the roadway tables but a table closer to the road so that was a bit nosy and distracting with people walking by your table inches from you. Overall, the food was very good, and the service was good. Service was horrible. They pushed us to order as quickly as possible, the food was terrible for the price. Annoying music playing in the background. They took our bread and brought us the menu without us asking because they wanted our table for the next customer if we do not order. Do not go. Great views and service! Reasonable prices and nice portions. We had a nice waiter but I think they are just understaffed and being seated in the far corner of the lower level in their "garden area" meant we were constantly being overlooked. Other customers sitting in that area appear to get forgotten about too. Waited about 50mins between finishing our starter and mains coming out. Our waiter was apologetic about it. Luckily it was a nice view so it disctracted us from the long wait. Another reason why we were disappointed was despite making a reservation 3 weeks in advance we didn't get a better table. Maybe we should've just physically turned up early for a table without booking. Food was average. I wouldn't have minded paying the price we did had we gotten a table with a better view but we didn't. Ok. Waiters were rushing around like crazy paying no particular attention to customer service. Food was ok. Overpriced compared to other places regarding taste. Delicious food with a breath taking view. Very friedlich service!